As healthcare professionals, we pride ourselves in helping our patients to live healthy, active lives. A primary goal of Occupational Therapy is to get people moving so they may improve in their daily activities and increase the overall quality of life. The best way to influence others is to practice good habits yourself and not let a busy career cause unnecessary weight gain affecting overall health and well-being. 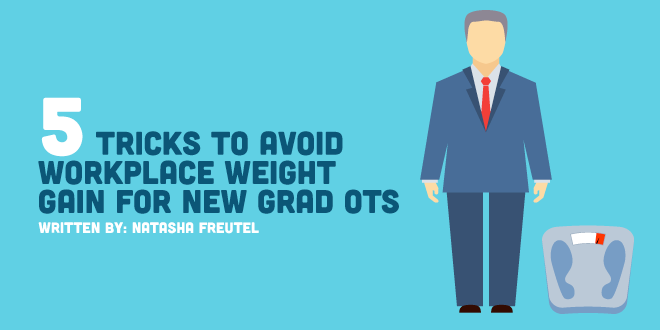 It’s common for people to fluctuate in weight during any significant life event, including the start of a new job. If you just started your career, you may have less time to exercise and eat healthy, causing the numbers on the scale too slowly creep up. Here are five tips to prevent workplace weight gain. The best way to avoid eating unhealthy food at work is to be prepared and pack a lunch! By bringing your food to work you not only ensure that you mindful about your food choices but you also have food available to eat throughout the day. This will help keep you full so you can avoid temptations, like donuts at the nurse's station! As much as eating the right foods are important, it is also important to eat at the right time. If you are a clinician who works 8 to 12 hour days, there is a good chance that you are eating lunch or dinner at an inappropriate time. Eating too late in the evening can contribute to weight gain. Many people find they are not eating enough throughout the day, and then binge eat when they get home. Give your body ample time to digest before going to sleep, and try to take a few minutes between clients to eat at a proper lunch time. According to WedMD, humans require 7.5 hours of sleep a night. Sleeping in itself won’t necessarily cause you to lose weight, but sleep deprivation does contribute to weight gain. When sleep deprived you are more likely to reach for sugary foods and see an increase in appetite-stimulating hormones. Sleep deprivation may also slow your metabolism and make you less likely to exercise or move throughout the day. An excellent strategy to help you reach your goals is to find an accountability partner. Just as we need to check in on our patients to make sure they do their home exercise program, having a friend to check in on your eating habits or meet you at the gym for a workout can significantly increase compliance and overall success. Make it fun...start a work running club, or organize a weight loss challenge. Getting the workplace on board not only makes it easier for everyone but can help with team building and overall morale. If you are putting in long hours or working weekends, it can be tough to find time to go to the gym. Be creative, get up early or go for a walk on your lunch. Try exercising at home before bed or join a fitness class on your days off. You can also work exercise into your day by taking a hands-on approach with your patients. Complete sit to stands with them or mirror them during arm exercises. Every minute of exercise counts, even if its only 5 minutes at a time. Every little change can make a big difference. Taking care of yourself is an important step to taking better care of your patients.